Shopping fairs, bazaars and fêtes offer fantastic fundraising choices for your charity or group. With the availability of shoppers and a captive audience for your fundraising message, there are copious opportunities for fundraising success. Visitors to a bazaar or shopping fair are there primarily for one reason - to shop. You can make sales for your fundraising effort and spread the message of your fundraising cause by selling themed items at a shopping fair, fête or bazaar. For example, if you are fundraising for an animal charity around the holidays, you can create dog and cat stockings for the shoppers. Fill each stocking with a few treats, a toy and a message about your charity. You can even personalise each stocking on-site by adding the pet's name in paint or embroidery. In addition to creating your own items for sale, you can also sell second-hand items. Your family and friends are likely to have plenty of knick-knacks and other items around their homes; ask them to donate these items toward your fundraising efforts. Food and drink are a big part of every shopper's experience, and a lot of money can be raised by selling these items. You can set-up your stall for a variety of different situations. With a basic set-up, for example, you may wish to sell only cups of tea, coffee and soft drinks. The mark-up on these types of items is astronomical, and all of the profits go towards your fundraising. 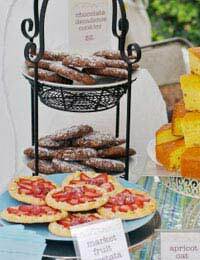 For a larger fair, you can run a cake sale, with home-made cookies, pies and cakes. You can even have a sweet jar for shoppers who are just a bit peckish. Depending on the venue, you may also be able to sell hot food such as chips, burgers and hot dogs at the fair. You will need a cooking device such as a barbecue grill and an area with adequate ventilation for the smoke and heat. Hot food is best sold outside, but if you are cooking inside, be sure to check with the building's owner about the location of any smoke detectors or sprinkler systems, lest you get a surprise when you fire up the grill! Fun fair games - Create a fun fair atmosphere at the shopping fair by setting up classic games like milk can toss, horseshoes and balloon popping. Raffle - Ask a local business to donate a fantastic prize, then sell raffle tickets to the patrons of the bazaar or fête. Pop quiz - Hold a knowledge quiz, with questions based on the theme of the shopping fair or your fundraising cause. Outdoor events - For larger shopping fairs, you can hold outdoor events like tug-of-war or a basketball shoot-out, with prizes for the winners. Shopping fairs offer tremendous exposure for your fundraising efforts. You may see thousands of people in one day, all potential donors to your charitable cause. Fundraising at a shopping fair is about turning the traditional stalls and booths into something memorable and engaging for your fundraising. You want people to purchase and donate to your cause, certainly, but you want them to remember the group you were fundraising for, too!